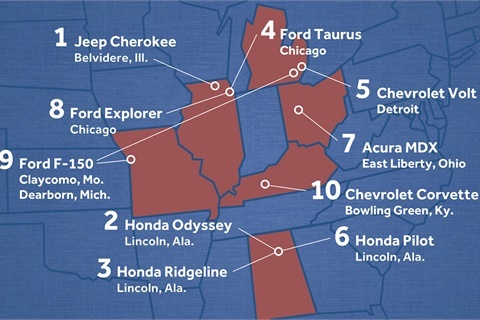 CHICAGO — Cars.com released its annual American-Made Index to help car shoppers determine the “most American” vehicles of 2018 that have the greatest impact on the U.S. economy. To arrive at this list, Cars.com looked at which cars are manufactured in America, have the most American parts, and support the most American factory jobs. According to a recent Cars.com survey, 71% of consumers believe buying American contributes significantly or substantially to the U.S. economy. This year’s ranking reveals that four of the top 10 American-made vehicles are produced by a foreign-based automaker. The Jeep Cherokee moves up one spot from the 2017 list. It’s Illinois-built, though Jeep is a division of Fiat Chrysler Automobiles (FCA), an Italian corporation headquartered in London. Still, the Cherokee comes in as the most American-made car of 2018 due to its high domestic-parts content, U.S.-manufactured engines and transmissions and FCA’s large U.S. factory workforce. 28% of respondents would only consider an American manufacturer when purchasing a vehicle. Before buying a car, two-thirds (66%) of Americans say they first find out where a car is built or where its automaker is headquartered. 82% of respondents believe that buying American-made vehicles will create more jobs in the U.S.
Cars.com’s American-Made Index ranks cars based on five factors: assembly location, domestic-parts content, U.S. factory employment, engine sourcing and transmission sourcing. The company analyzed more than 100 U.S.-built vehicles to arrive at the top 10. In 2017, Cars.com revamped the methodology for its American-Made Index to focus on the impact of the choice between buying one car versus another amid only three models qualifying under the prior methodology.